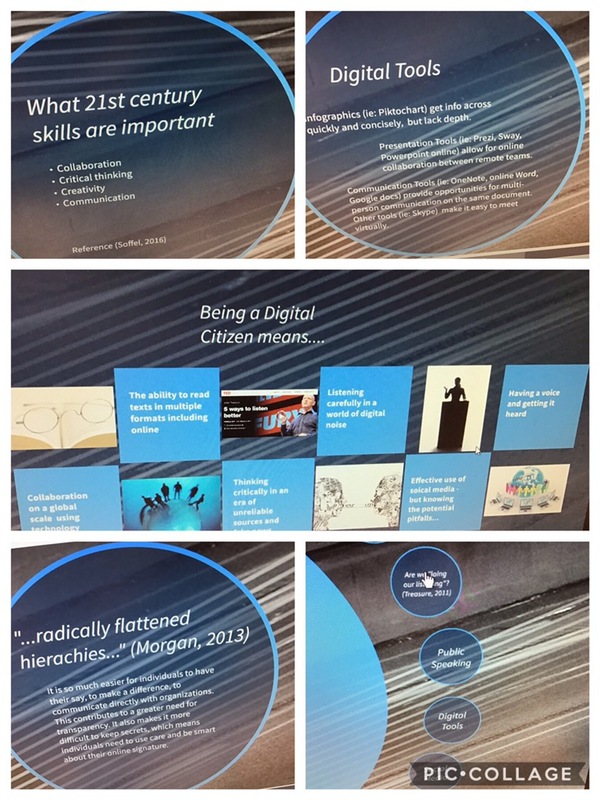 Part of ExtendmOOC… module 2. Digital literacy. What do we mean by that? In communications class, I tell students it’s about navigating multiple channels. No longer do I “just” teach reading and writing… the way in which we gather and present information is fast-paced and multi-modal. Oh, and it needs to be shareable, not static. A few has back, realizing all this, I started to weave multi-modal into all my classes and assignments. 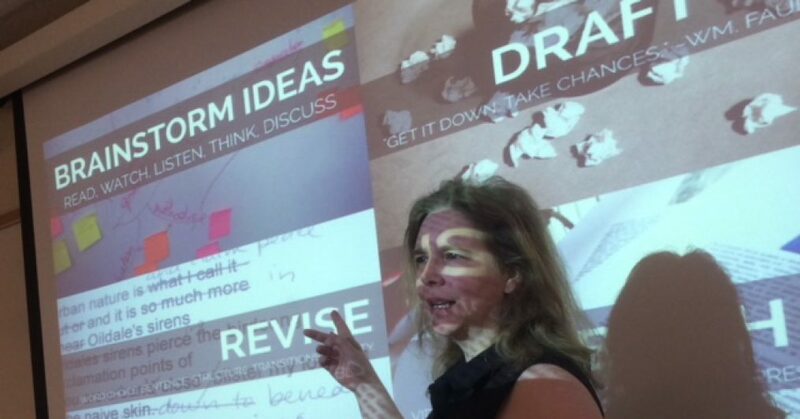 On Twitter, I came across the acronym WOVEN by Rebecca Burnett, Director of Writing and Communication at Georgia Tech, and with her permission began using it as a framework for my communications class. Later, the idea was adapted into our revised cross-college first semester communications course as a key learning objective: to use, respond effectively, and create in ways that encompassed written, oral, visual, electronic, and non-verbal elements. WOVEN. I encourage students to think in terms of WOVEN and to adapt the technologies that work best for a particular purpose. It has to make sense and not just be technology for the sake of technology. As one of my favourite online professors once said “Technology is not (just) innovation” (Al Filreis of ModPo) – this from someone who uses tech everyday to connect with a massive online class! An example of one assignment was for students to read, watch, listen to, and respond to a variety of sources about the digital world we live in. 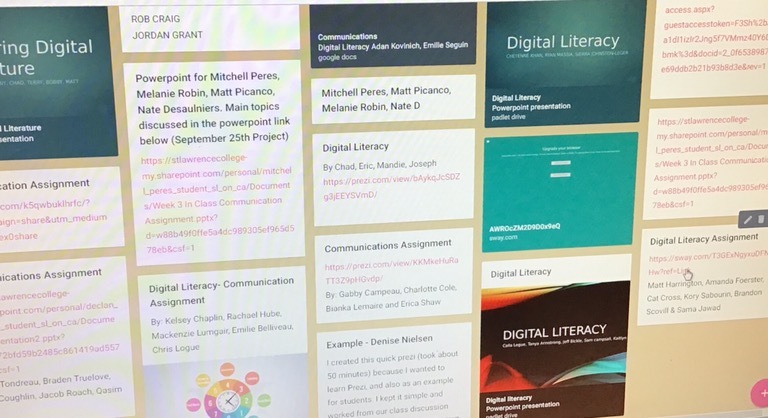 Then as groups they created shareable presentations about their learning in a variety of modalities (link here is to a Prezi I created as a model) and submitted them to a Padlet board – but images below included because links are slow on devices….another lesson in digital literacy. Digital literacy is adapting, changing, figuring out the right technology or mix of technologies for an audience. It’s about being comfortable with change, because there’s always something new around the corner.